Collard greens, also called collards, are a member of the cabbage family of vegetables. Like other cruciferous plants, collards have been shown to help protect against cancer, particularly for those on a vegan diet. Collards have also been shown to help protect against macular degeneration, an eye disease. Collard greens are “tough”, so they are usually cooked, either by steaming or by cooking in soups, curries, stir-fries, or in casseroles. Occasionally, we add one or two stems and leaves to our raw vegetable smoothies. Collards are one of the stronger tasting members of the cabbage family. When purchasing, select collard greens that are crisp and have dark green leaves. See our Cooking Collard Greens recipe section. 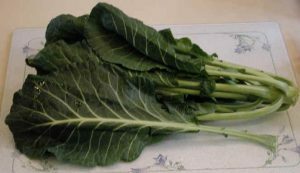 See the nutritional charts below for raw and cooked collards.